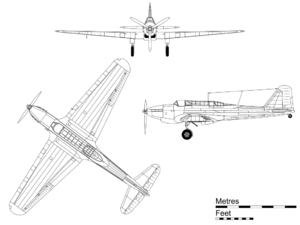 Fairey Battle ("Bitka") je bil enomotorni propelerski lovski bombnik, ki ga je razvil britanski Fairey Aviation Company v 1930ih za potrebe Kraljevih letalskih sil. Poganjal ga je Rolls-Royce Merlin V12, ki se je kasneje uporabljal na lovcih Hawker Hurricane in Supermarine Spitfire. Battle je bil velik korak naprej od prejšnjih letal, vendar pa je bil v primerjavi z lovci iz 2. svetovnne vojne počasen, slabo zaščiten in je imel majhen dolet, zato so ga hitro upokojili. Podatki iz Fairey Aircraft since 1915; Taylor 1974, p. 283. "Elegantly Obsolete...the Fairey Battle". Air International, Vol. 20, No. 3, March 1981, pp. 127–134. ISSN 0306-5634. Garcia, Dionisio. "Air Force on the Edge: Belgian Military Aviation in 1940". Air Enthusiast, No. 96, November/December 2001, pp. 65–68. Stamford, Lincs, UK: Key Publishing. Gifford, Simon. "Lost Battles: The Carnage of May 10 to May 16, 1940". Air Enthusiast, No. 109, January/February 2004, pp. 18–25. Stamford, Lincs, UK: Key Publishing. Lever, John. Fairey Battle in the RAAF. Koorlong, Victoria, Australia: John Lever, 2002. ISBN 1-876709-07-3. Matricardi, Paolo. Aerei Militari: Bombardieri e da trasporto (in Italian). Milan: Mondadori Electa, 2006. No ISBN. Moyes, Philip, J.R. "The Fairey Battle." Aircraft in Profile, Volume 2 (nos. 25–48). Windsor, Berkshire, UK: Profile Publications, 1971. ISBN 0-85383-011-8. Moyes, Philip, J.R. Royal Air Force Bombers of World War II (Volume 1). Windsor, Berkshire, UK: Hylton Lacey Publishers Ltd., 1968. ISBN 0-85064-051-2. Pacco, John. "Fairey Battle" Belgisch Leger/Armee Belge: Het Militair Vliegwezen/l'Aeronautique Militare 1930-1940 (bilingual French/Dutch). Aartselaar, Belgium: J.P. Publications, 2003, pp. 52–55. ISBN 90-801136-6-2. Shaile, Sidney and Ray Sturtivant. The Battle File. Tonbridge, Kent, UK: Air-Britain (Historians) Ltd., 1998. ISBN 0-85130-225-4.